Tommy tells the tale of a strange death, foretold by the gypsy. “Hullo, Tommy. Is the boss in?” The inquirer was a young man in a soft felt hat and a discoloured raincoat, and the question was addressed to Tommy Burke, Dixon Hawke’s assistant. Tommy was sitting at his desk in his employer’s office at the Dover Street chambers, and he surveyed the caller, a journalist friend of his, with interest. Tommy suddenly rose from his chair. He waved his arm towards a chair. His manner was impressive. Webster lived with his wife in a lonely house near the village of Scorewell, pronounced Skorrel (said Tommy), and a more outlandish spot you never did see. It’s a thousand feet above sea level, and is in the wildest part of the Peak District. You know what it’s like. Hill and moor land, scattered with monstrous lumps of rock and deep ravines. The house was called Mount Pleasant, and it was situated in what I thought was a pretty dangerous spot — near one of those ravines. There was only a rickety wire fence to prevent you going over in the dark. Webster was a queer sort of bird — a mystic, y’know — and quite a contrast to his rather flash-looking wife. She was thirtyish, and he was about ten years older. There came a time when Webster felt he was on the verge of staggering this world by clearing up the mysteries of the next. He went so far as to claim that he was about to settle the question of exactly what we can expect after death, and this caused excitement in the scientific world, because Webster was no mere charlatan, as you know. He stood high in the estimation of all who know what’s what, and what isn’t. He set off on the long run, taking only a flask of tomato juice by way of refreshment. He was one of those birds who believe in keeping fit by scientific starvation. There was a full moon, and it was one of those quiet, breezeless nights. I don’t know whether you’ve ever been in a mountainy district on a night like that. It’s queer. Everything seems twice its normal size, and the landscape’s all yellow and purple and grotesque and unnatural. That’s how it was on that straight stretch of narrow, white road between a couple of beetling mountain sides, when Webster spotted a petrol-station — a forlorn-looking shack looked after by one man. Webster knew that his tank would want replenishing before long, so he pulled up. The petrol-man was a cheerful sort of cove named Brown. The guv’nor and I interviewed him afterwards, and it’s from him that I got this part of the story. After telling Brown to fill her up, Webster asked if his petrol station was on the phone, and Brown said it was. The place, in fact, was quite civilised, for there was a post-box there as well. Webster got out of the car, went inside the hut, and put through a call. When he came out, Brown was putting the petrol-pipe back on its hook and on the opposite side of the roadway was a gipsy caravan, with a bony, dispirited-looking horse between the shafts. Brown saw Webster staring, and he turned. He afterwards told the guv’nor that he got quite a start, for he had neither seen nor heard the thing approaching, although there are no bends in the road for several hundred yards. Sitting up in front of the caravan, holding the reins, was a tall bloke wearing a wide-brimmed felt hat with a high crown. I remember I was sort of impressed with old Brown’s description of that hat, and I can picture it quite well. These gypsies don’t bother to dent ‘em in like trilbies. It was not quite of the sugar-loaf variety, but rather like a trilby run to seed. The fellow’s face was completely in the shadow, and Brown never glimpsed his features at all. By his side was the oldest-looking woman Brown had ever seen. She had a gaudy ‘kerchief bound closely round her head, and this seemed to emphasise the bird-like qualities of her shrivelled old face. Her nose was like a vulture’s beak, and the moonbeams caught the whites of her eyes, so as to give them a baleful, unearthly appearance. The old woman turned and looked at the two men, but the man by her aide looked neither to right nor to left. Slowly and laboriously the old woman climbed down from the caravan and approached Webster. Brown told us that, in a way, it was a whining plea, and yet there was something compelling about it — as though she offered Webster no alternative but to cross her hand with silver and have his fortune told. Webster chuckled, but seemed a little bit uneasy. Brown, too, had a vague feeling of that sort. The old woman took the money, and, beckoning him to follow, went to the back of the caravan, pulled down the wooden steps, and climbed up inside. Webster followed. Brown, whose curiosity was all worked up, strolled round to the back and glanced in. The door was open, and the moon shone in, slantwise, so as to light up the interior sufficiently for him to see the gipsy woman sitting on one side of a table gazing into a crystal, and Webster sitting on the other side watching her. Brown strolled back and stood leaning against a petrol-pump, and after a minute Webster came out of the caravan holding a sealed envelope. “I asked her whether it was good or bad,” answered Webster, smiling faintly, “and she said I might be inclined to think it bad. So I said — ‘I’m off on an important mission which won’t fail — which mustn’t fail — so I don’t propose troubling my head with thoughts of bad fortune. Write it down, and stick it in this envelope. I’ll read it later. He was about to put the letter in his pocket when his eye alighted on the posting-box, and he was struck with a sudden whim. He took out a fountain pen and wrote the address of a Morecambe hotel, which Brown was afterwards able to recall. Then he took a stamp out of his wallet, and dropped the letter into the box. “She’s a rum ‘un,” agreed Brown. They both stared down the road, but there was no sign of the caravan. The horse had only been crawling along, and it seemed impossible that it should have travelled out of sight in that short space. They could only conclude that, being engrossed in conversation, they had lost track of the time. Webster paid for his petrol and got back in his car. He took a pull at the flask which he produced from the pocket of his car, nodded good-bye to Brown, and started away. Now we come to the real substance of the story. Webster had gone about a couple of miles down the road when his car hit the stone parapet of a bridge and hurtled over into a stream. He was killed, and his car was completely wrecked. His great discovery was lost to the world. The police thought that something might have gone wrong with the steering and they inquired at Brown’s petrol station. In the course of the interview Brown mentioned the gypsies, but expressed the opinion that they had had no chance of interfering with the car. Anyway, the police failed to trace the gypsies. You never can. They move about all the time, and you can’t tell one from the other. The guv’nor came into the case in the ordinary course of duty in the service of an insurance company that pays him a retaining fee. Webster’s life had only recently been insured, and the fatality set the company back ten thousand of the best. Mrs. Webster was the beneficiary. We both went along to that lonely stretch of road, arriving there before Webster’s car tracks had been obliterated by other vehicles. We traced them on foot from Brown’s petrol station to the bridge where the accident occurred, and found that for the first half-mile they went straight and clean along the centre of the road. Then they jerked suddenly to the side, and there were skid-marks, as though the driver had suddenly tried to dodge something. The guv’nor spent some time searching about the road at this point. The tracks were wobbly for another half-mile, and were close in to the side of the road — so close that, in places, only the tracks of the offside wheels could be seen. We came to a bend, and there Webster’s tracks crossed over to the wrong side of the road, and continued there for several hundred yards. Back they came again, and, for the next mile before we reached the bridge they followed a fairly even course along the middle of the road once more. Just in front of the bridge they veered suddenly to the left, and there were several stones missing from the parapet. After that the guv’nor inspected the wrecked car, which had been taken to a garage in the nearest village — and, my! how he inspected it! Frankly, old man, it’s a little bit embarrassing to be with him sometimes, because he doesn’t care two hoots about people thinking him ridiculous. There was a smirking police inspector making sarcastic remarks to the garage manager, while the guv’nor examined every square inch of that car through a magnifying glass. When he pulled Webster’s task of tomato juice from the pocket and asked to be allowed to take it away, there were undisguised jeers. We drove back and had a long talk with Brown. 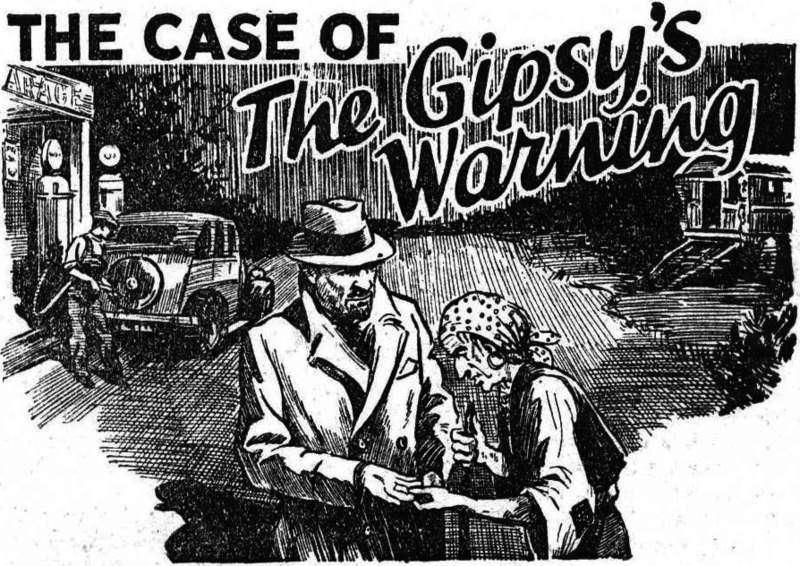 The guv nor was intrigued by his story of the gipsy — unreasonably so, it seemed to me. To be quite honest, I was a little irritated with him when he sent me to Morecambe to retrieve the letter winch Webster had posted to himself. My irritation was justified, because the trip was quite unnecessary. The letter had no bearing at all on our inquiry. But that’s how it is with him at times. It’s the eccentricity of genius, old man. When I got back to the village inn at Scorewell, where we were staying, I found him in the sitting room examining some of his own visiting cards under a pocket microscope. No, that wasn’t eccentricity. They weren’t ordinary cards. They’re kept for a special purpose. The surface is treated with a sensitive solution, and, when you want somebody’s fingerprints on the sly, you hand him a card and then make an excuse to get it back. Tell him it’s your last one. Or else, if he puts it on his hallstand, which he generally does, retrieve it surreptitiously. The tomato juice flask stood on the table in front of him. It was covered with a black powder, and clusters of fingerprints were discernible on it. The stopper was off, and it lay amidst a collection of saucers and bottles containing chemical reagents. I was about to question the guv’nor as to the meaning of if all, when he happened to glance out of the window. A passer-by in the village street was the object of his attention. I followed the direction of his pointing finger, and saw a big man striding along, glaring at the ground as though he dared it to give way beneath his feet. “I called at Mount Pleasant to ask Mrs. Webster a few formal questions,” the guv nor went on, “and she insisted on her friend, Mr. Sellers, being present during the interview. She seemed reluctant to answer my questions, and Mr. Sellers was frankly resentful of my presence. As is often the case — I suppose I’m slow-witted — I suddenly realised that we were in the midst of something fishy which the guv’nor had sensed some time beforehand. I thought about those car tracks and about the guvnor’s fierce attack on the case — on all fronts, as it were. I realised that he had sent me to Morecambe simply because he became suddenly keen to lay hold of every tiny fact connected with the case, however remotely. I produced the letter, but, as I say, it didn’t have any bearing on our investigations. The guv’nor was intent upon dealing with the very material matter on hand, and this seemed no occasion for worrying about fortune-tellers. It was getting dark, and there was a stiffish wind blowing up when I got the car out of the pub garage. The guv’nor got in beside me, and we set off up the steep, winding road which led to the Webster home. The guv’nor was very preoccupied, and several of the questions I asked him went unanswered. The breeze grew stronger, and the night grew darker. I shall never forget it. When it’s stormy in that district, you hear a kind of moaning and whistling, as the wind cuts round the crags. We had drawn up outside the house and were looking over that ravine which runs up by the side of the garden. As you near the top of that road, you get the impression that you are driving over the edge to your doom. Having turned the car round and put the brakes on, I sat there for a few seconds and then began to think things too tame. There was a light from one of the down-stairs windows facing me, and, the curtain not being drawn, I could see into the room. I saw Mr. Sellers pass across and stand by the fireplace, and I also caught a glimpse of Mrs. Webster. They were looking towards the doorway, where, I gathered, the guv’nor was standing, and, as the windows, which were of the casement type, were partly open I guessed it would be possible to hear what was going on if one were close enough. I proceeded to disobey orders, and was presently standing outside a window, eavesdropping. “You say, Mrs. Webster, that you have never, on any occasion, touched the task in which your husband carried his tomato juice,” said the guv’nor. There was a half-stifled cry from the woman, and Sellers broke in with an angry shout. “Murder! What do you mean?” yelled the man crazily. I turned and nipped back down the path and got in the car, feverishly figuring it all out. if you try to do the same, Beverley, you’ll see it was a dashed ingenious idea. Strychnine poisoning causes convulsions, and is easy to detect, provided you happen to be looking for it. But are you likely to look for it when making a post-mortem examination of a mangled corpse — the obvious victim of a car crash? The convulsions rendered the man at the wheel helpless. Probably his leg stiffened so that his foot pressed down on the accelerator, and all he could do would be to hang on to the wheel like a drowning man clutching a straw. They must have visualised all that — and also the possibility of the car catching fire after the crash, so that all evidence of the real cause of death would be destroyed. I sat behind the wheel for a moment or two, and as the guv’nor didn’t come I opened the door and looked up the path. What I saw gave me the prize scare of the century. Sellers had followed the guv’nor and pounced on him, thinking to hurl him over the ravine. I ought to have been on the lookout for some such move, and so, for that matter, ought the guv’nor. He was the one man who stood between them and their continued existence, and — well, people do sometimes fall into ravines in that district; it would have been fairly easy to pass the guv’nor’s death off as an accident in the dark. There were two things that Sellers hadn’t allowed for. One was the possibility of the guv’nor having somebody with him, and the other was the possibility of the guv’nor having the strength of about two ordinary men. Sellers was half a head taller than the guv’nor, and nearly a couple of stone heavier, but he was having a mighty rough time of it. They had both crashed through the fence and were struggling on the sloping, slippery ground which fell away to the cliff edge. Just for a second I stood holding my breath, for there seemed nothing to prevent the pair of ‘em going over. Then I got possession of myself again and I whipped back the car seat and seized a big spanner. I stood over the struggling pair, and when Sellers came uppermost I brought the spanner into play to perform its natural function. I loosened his nut for him! He would have gone bowling over the edge, his dead weight dragging the guv’nor along, too, but I managed to grab one of his ankles and dig my heels into the ground. The guv’nor scrambled to his feet and we got the unconscious bloke’s hands tied behind him. After some little thought we decided that it was our duty to take the pair of ‘em to the police station in our car. But the little drama was not yet played out. When he went back into the house the guv’nor found Mrs. Webster lying on the floor groaning. She had taken the strychnine that had been left over, and there was nothing we could do. She died in a very short space of time. Later a chemist, who saw Sellers’ photo in the paper, identified him as a man who had bought strychnine from him, signing some other name in the poison register. The journalist had listened to this story with close interest, and as the young detective sat back and regarded him quizzically from under lowered lids, he frowned in perplexity. “Nowhere — so far as we are concerned,” grinned Tommy. Beverley showed signs of irritation. The exasperated reporter, conscious that Tommy was deliberately holding something back, at last hit on the vital question.